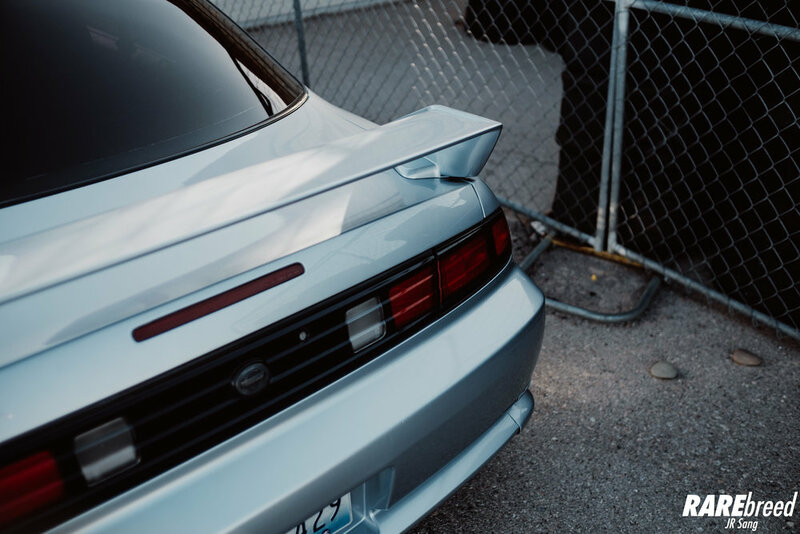 Our photographer JR recently linked up with Eric, the owner this pristine 1995 S14. Eric has done an incredible job keeping his S14 mint- you'll always see a 240 that has experienced a wall tap or two, but very rarely will you ever see one as clean as this. Did we mention that this one in particular got a heart transplant. Scroll down and check it out! 100% clear headlights always clean up the front end nicely. Eric swapped the OEM headlights with a set from Royal Natives. In addition, he swapped out the turn signals and side markers with clear lenses. You may be wondering that Eric's S14 doesn't look like your traditional 240. That's because he converted the Zenki rear end to the JDM Kouki bumper fitted with a JDM spoiler and valances. The front end had a few changes as well. Keeping the Zenki look, Eric installed a Navan Front Bumper. So clean! Follow Eric and his build progress on Instagram! Heart of the beast. The legendary SR20DET. The interior holds down the JDM style with a Nardi wheel and D-Max floor mats. To keep everything planted to perfection, Eric rocks an aggressive square set of 18x9.5 +15 SSR Agle Minerva's. To minimize rubbing and maintain a functional drift set up, a wide variety of suspension parts are in place. PBM coilovers, Villians Angle Kit, and Godspeed suspension arms to name a few.